Deja Vu is a great example of a well taken care of 380 that was in fresh water for the first 15 years of her life and it shows. This Catalina 38 Sloop has earned an international reputation as the leader in her class. Built to accentuate style performance and comfort this Catalina has become the choice of sailors worldwide. Whether you are planning a weekend getaway or a cruise to the islands this 38 footer is ready to accommodate. Deja Vu has been prepared to cruise and is ready to go !! West Florida Yachts would love to guide you through a personal showing of this 38' Catalina 380 2000. 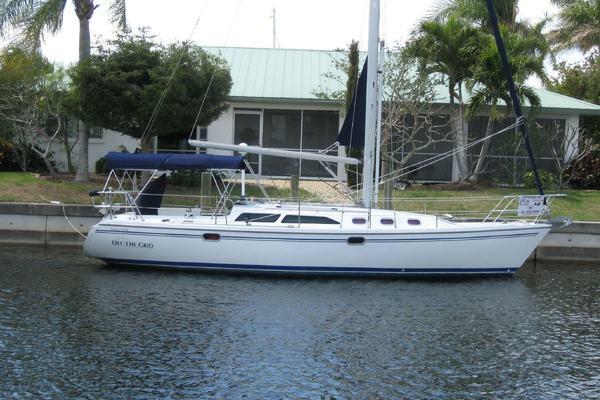 This yacht for sale is located in Cape Canaveral, Florida and priced at $77,900. For a showing please contact us by filling out the form on this page and we will get back to you shortly! In the cockpit excellent visibility forward is assured by the low profile mainsheet traveler. For the crew the standard cockpit table comes with 2 drop leafs beverage storage and footrest. 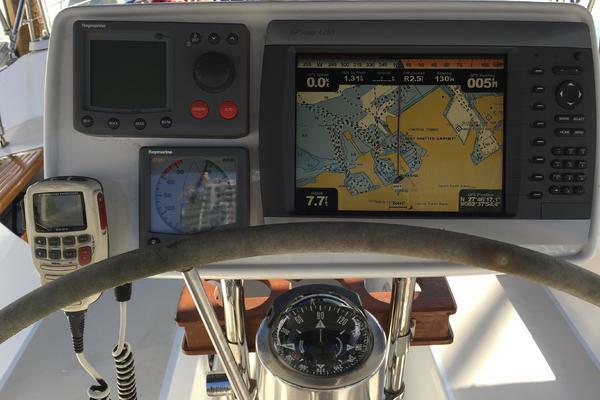 Steering is traditional pedestal. The wide decks are textured nonskid with gently angled surfaces without sharp corners. The oversized stern boarding ladder leads to hot and cold fresh water shower and 2 large storage lockers. Below deck you will find an environment that functions underway and in the harbor for quiet retreats as well as entertaining your guests. Varnished teak interior bulkheads cabinets and joinery speak of the quality that goes into making the 380. A stuffy cabin won't be a problem for you with all the opening hatches assuring abundant light and ventilation. The teak navigation desk is mid ship with plenty of space for your electronics. The owner's cabin aft is highlighted by the oversized queen size bed complete with storage bin, locker and large hatch on each side. Two separate dressing areas and hanging lockers allow plenty of room to move. Both forward and aft cabins have double berths and generous hanging lockers with plenty of adjacent storage. A private entrance from the owner's cabin leads to the ultramodern head. The bright and airy area has the luxury of an enclosed shower with a one-piece acrylic door. A separate sink and vanity are provided for family or guests in the forward cabin along with numerous drawers and shelves for storage of personal items while onboard. The L-Shaped galley has all the conveniences and space to prepare a gourmet meal. A three burner stainless gimbaled gas stove with oven, polished stainless double sink and top load refrigeration round out the galley.